Cacti come from either North or South America where they grow naturally in the wild. 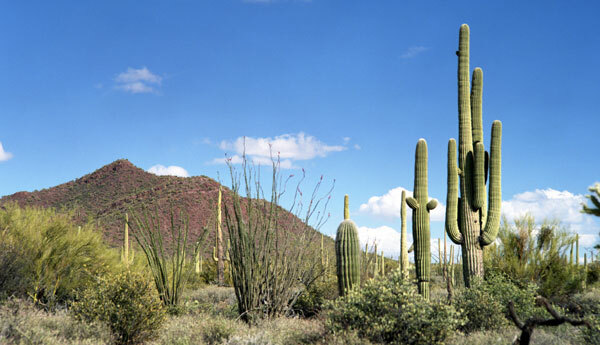 Some cacti can be seen growing outdoors in other places with a warm, sunny climate but they have been brought there by man. Many people think that cacti grow in deserts. Nothing can grow in a true desert – but many cacti do grow in very dry areas which might be known as deserts. The giant saguaro grows in the Sonoran Desert. This is the second largest desert in North America covering parts of California and Arizona and stretching over the border to Mexico. As deserts go this receives quite a lot of water – it has two rainy seasons one in the winter and another in the summer, but nothing in between. As you can see the cacti are growing among other plants, all of which are adapted to survive in dry areas. The Andes is the longest land mountain range in the world. It stretches along the western coast of South America for about 7,000km. 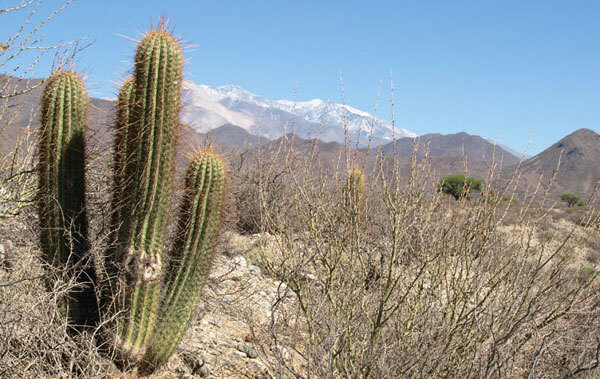 It looks like a bleak landscape, but many cacti are adapted to live in these high regions. 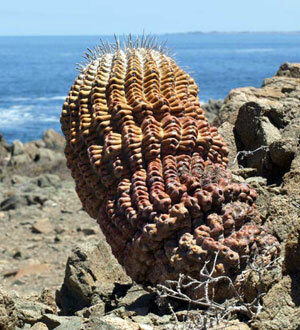 This very old Copiapoa is growing by the coast of South America in Chile. Sometimes years can go by without any rain – but cacti like this manage to survive. The reason for this lies in the sea. The cold sea water means that cold air moves over the hot land, which produces fog. Usually this happens every morning and the cacti can find the water they need by absorbing moisture from the fog. Epipytic cacti live in the tropical rain forests that stretch across the north east of Brazil and central America. Conditions are very different here, in many areas it rains nearly every day! See Ones that grow on trees.